LAS VEGAS – Kyle Irwin knew after Saturday night he had some work to do. 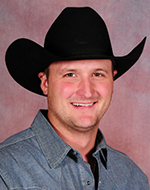 The Robertsdale, Ala., steer wrestler has proven that the last two nights of the National Finals Rodeo. 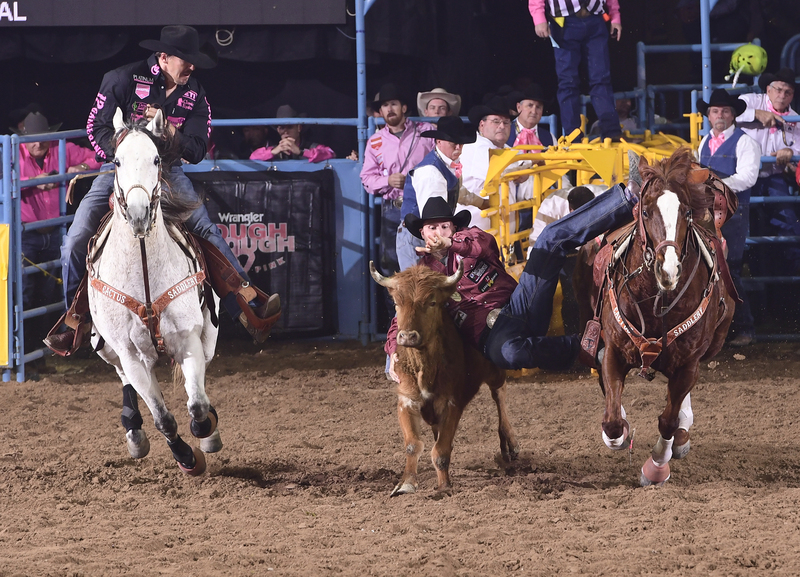 On Monday night, Irwin wrestled his steer down in 3.9 seconds to finish in a tie for fourth in the fifth go-round. “I like that,” said Irwin, who now lives in Westville, Fla., with his wife, Randa, and their two children. “I went out of the average in the third round, so now we’ve got to get them check for check, round for round. I have never placed in the fifth round, so that’s two nights in a row that I did that since I first qualified for the finals. I like that. A round win is worth $26,231 each night, and it gives the winners in each event a chance to receive more hardware – a go-round buckle courtesy of Montana Silversmiths, which has the nightly buckle presentation at the South Point showroom stage. “I want to take my boy on stage with me,” he said of Tripp, who will turn 2 in January. “We are going to get there. He’s having a blast. He can’t say ‘back number,’ but he takes it to me every morning and wants me to put it on his PJs. He likes to day bulldog, and he will run over to my wife’s leg or my leg and pull and twist. That’s important, because family time is special. Irwin was on the bubble to make the NFR at the end of the regular season, and he made it home just in time on the final day of the 2018 campaign to see the birth of his daughter, Ellie. Enjoying two children under the age of 2 is special, and over 10 days in Las Vegas, he can compete for the biggest money in the game and have his family with him. By now, though, Irwin is a veteran. This marks his fourth trip to Sin City for this championship, so he knows his way around town and the Thomas & Mack Center. So far through five nights, he has pocketed just shy of $53,000 and has moved up seven spots to seventh in the world standings with $128,275. “I feel like it has gotten a different feel to it than even it did last year,” said Irwin, who attended Western Oklahoma State College and Northwestern Oklahoma State University on rodeo scholarships. “It’s still prestigious, but I’m more comfortable and calm. It comes from experience.